One of the best things about curry is that you can make them so many different ways. Since I love vegetables and promote “eating foods with lots of colors”, I decided to make a Yellow Squash Curry. Not to mention that I have been on an Indian food kick lately! This curry recipe makes a perfect side dish to all your meals and it’s so easy to make, and the color is beautiful as well. 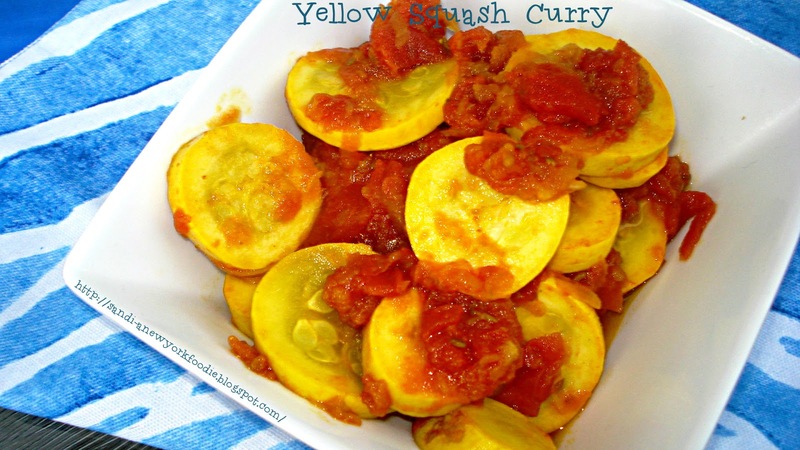 To see how I make my Yellow Squash Curry, keep on reading! In a medium saucepan over medium heat add the oil and when hot, add the onion and saute. Cook until golden brown for about 5 minutes, stirring frequently. Reduce the heat to medium-low and add the tomato. Cover the pan and cook until the tomato becomes completely soft and mashed and is combined with the onion to form a course paste. Stir every minute or so and and lightly mashing the tomato, about 5 minutes. Add all the seasonings and stir to combine. Cook uncovered, stirring frequently for about 3 minutes. Add the squash to the pan and stir to combine. Cook for 2 minutes, stirring frequently. Add the water and bring to a boil over high heat. Once boiling, reduce the heat to medium-low. Simmer for about 10 minutes until the squash is tender, stirring occasionally. Some of the water will cook off. You can eat this hot or at room temperature. It freezes very well too. P.S. Another wonderful curry dish is my Black Bean Curry. A perfect main dish to go along with all these vegetable curry recipes is my Indian Curry Turkey Meatballs.